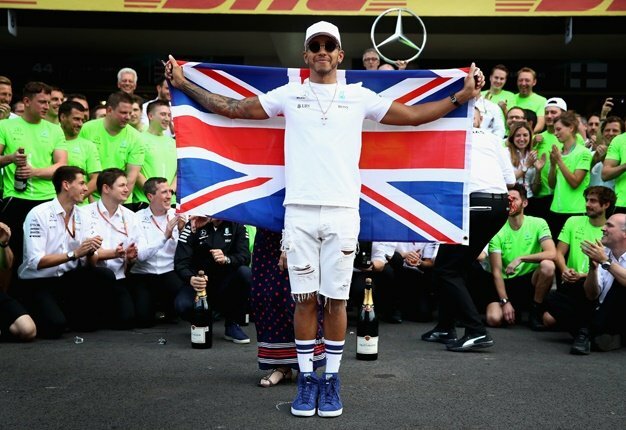 Lewis Hamilton and his Mercedes team swapped tributes Sunday after the five-time champion's Brazilian Grand Prix victory sealed another Formula 1 'double' and their fifth consecutive constructor's title. "These guys have worked so hard over the past six years. It's been an incredible journey. This is what we've worked for - every single day," he said. "I've always said it's such an honour to drive for them. We were a sitting duck at one stage. "We were having problems with the engine. I just want to thank everyone. The team give me the tools and I do the best I can. "It was incredible to have the spirit of a racer, that I've had since I was five years old, and I never lose that. I had that fight like I was a kid today." Hamilton's race engineer Pete Bonnington said: "It's been the best championship yet. It's been fantastic given how competitive it's been. It's been an awesome year. "Lewis has driven perfectly. He always wants to win." Hamilton, in second place on the track, had a perfect view of the 44th lap clash that saw Verstappen spin out of the lead after colliding with Ocon's Force India. "Then I was trying to be perfect on every lap," he laughed. "You make sure there's space. You always make sure there's space," he said.